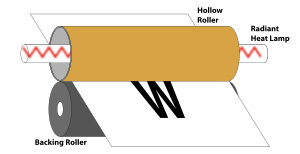 As you can see in the diagram above, the sheet is sandwiched between the two rollers. The top roller holds the element of heat which melts and permanently presses the toner into the fibers of the paper. The bottom roller is sometimes heated as well, particularly in the case of duplex (two-sided) printing. You may be wondering if the roller can get too hot or how the piece of paper does not get burned. There is a thermostat built in that will cut the heat once it has reached a certain temperature. You probably notice the sheet is warm when it first prints out. It cannot get overheated, though, because the paper moves so quickly through the fuser. The fuser kit will begin to wear and require replacements because of the heat and accumulation of dust particles. Of course you can try to clean the rollers, but sometimes the damage is done. You will know the time has come when the printed pages consistently have lines on them, usually as a result of a scratched roller surface. Additionally, most modern printers will automatically alert users when the fuser kit needs to be replaced. This alert may appear on the printer’s control panel or in the printer software on the computer. A fuser does just what the name implies; it fuses the toner onto the sheet of paper by using heat and pressure. Though not a widely discussed component of a printer, it is certainly one of the most important. Without it, loose particles of toner would fall off the page, but more realistically, printed text and images would not be as resistant to smearing and smudges without the bonding process that the fuser provides.